Healthcare is our specialty and we are the only social media analytics company that is focused solely on it. Cited in hundreds of published journal articles and relied upon by government offices in the US and Europe. Over 30,000 healthcare topics and conversations from billions of tweets, and over 1 million identified influencers in any healthcare topic. Symplur has the world's largest database of healthcare stakeholders so that you can segment and analyze any healthcare conversation by Doctors, HCPs, Caregivers, Advocates, Academics, Pharma, Government, Media etc. Access to the Healthcare Social Graph® Score which is a propriety algorithm that accurately ranks KOLs based on their true influence in healthcare social media while avoiding the flaws of the easily manipulative metrics like tweets and mentions. Understand who is interacting with whom by analyzing the network centrality graph for any healthcare related conversation. You will be able to quickly identify users who are most central in the topic, who are either functioning as authorities or as a hubs, connecting people with others. Instantly see the trending issues covering any aspect of the healthcare industry using advanced Natual Language Processing algorithms. 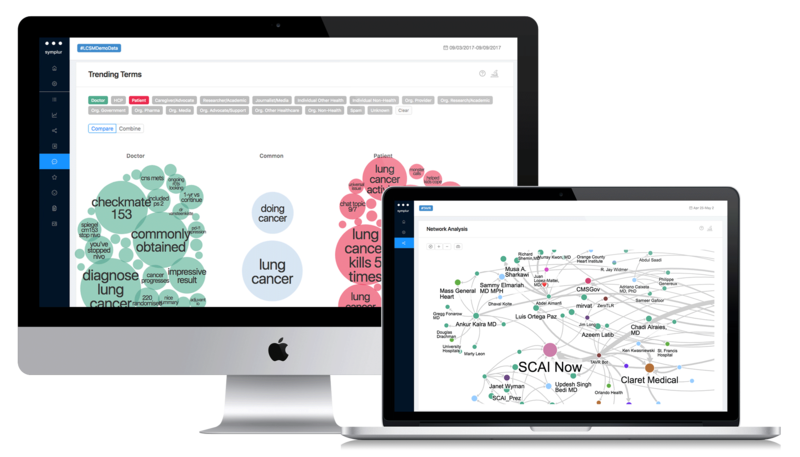 Visualize trends over time or compare two healthcare stakeholder groups with each other to identify the unique characteristics. Never miss an opportunity to learn from other organizations' mistakes or success stories. The tweets you absolutely must be aware of are brought to your attention by our sentiment algorithm optimized for the healthcare industry. Learn what's driving the conversations by seeing the tweets ordered by healthcare stakeholders that received the most retweets, or list the tweets that sparked true back-and-forth conversations.